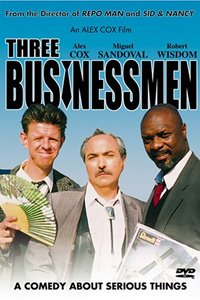 Alex Cox (Straight to Hell/Repo Man) makes films that look and feel different, as is the case with the unique Three Businessmen. You don't quite know where you'll end up in this sharp-witted subversive comedy. The film hops around from Rotterdam, Liverpool, Hong Kong, Tokyo, and eventually to the Mexican desert. Bennie Reyes (Miguel Sandoval) is a crude, fast-talking American art dealer in southwestern objects, who arrives in Liverpool and experiences some difficulty as he checks into the cold but swank Adelphi Hotel. In the huge hotel restaurant there's only one other patron, the stuffy Britisher Frank King (Alex Cox), whom he's seated next to. When Bennie asks if the fruit served is fresh or frozen and the waiter never returns, the two get into a conversation. It turns out Frank has been waiting for thirty-five minutes, as he politely says nothing but reads his newspaper. As a coincidence, the reticent Frank is also an art dealer--but in African objects. Upon realizing that they won't be served, the two out-of-towners decide to explore Liverpool and find a restaurant for dinner. Their hotel is near Matthew Street where the pub the Beatles started in is located. They notice how many buildings are deserted, but Frank is amazed that amidst all the decay there's a Mercedes dealership. In a pub, a patron tells them Liverpool is bouncing back with help from Internet businesses and the poverty they see is being addressed by new types of business infrastructures. Leaving the pub they have difficulty finding a restaurant because Frank is a vegetarian and Bennie a meat eater. When they walk around and try some restaurants, they find that they are all closed. Hoping to get back to their hotel as they have a busy schedule the next day, they take the underground and get off at the wrong stop. They are now lost and refuse to ask directions. They also can't remember the name of their hotel or on what street it's on. Here they spot a Greek restaurant and order an abundance of food, but Bennie has an anxiety attack and is forced to leave the restaurant. Bennie apologizes to Frank by saying: abundance scares me -- there's such a thing as too much good (capitalism!). On their fantasy journey they wind up in Hong Kong and Tokyo, with the same futile results of not getting served. They finally take a taxi and end up in the desert at dawn and stop off at an outdoor Mexican cafe, where they meet another hungry and lost businessman-Leroy Jasper (Robert Wisdom). He figures out from their names that they must be the Three Kings. Sure enough, after finishing their refried rice meal, they meet a baby and offer him gifts. It was a film that pleasantly brought to surface odd moments and was filled with quirky comments. The line I enjoyed best was when seafood was referred to as--you see food and eat it. That's pretty much my take on this odd comedy, where some laughs come about in an unexpected way and you might as well laugh because the surreal story will only lead you into the middle of a desert if you take it too seriously. Which is what happened to the lost souls depicted, who are the businessmen doomed to be wandering the world forever unless they pay more attention to their deeds and actions. ... Debbie Harry sings "Ghost Riders in the Sky," as this follows Bennie's earlier story about a wonderful dog he had, Rex, who would spin on his back whenever he, Bennie, sang that haunting song. It's a film for those who could admire a surreal black comedy such as BuÃ�Â±uel's Discreet Charm of the Bourgeoisie.